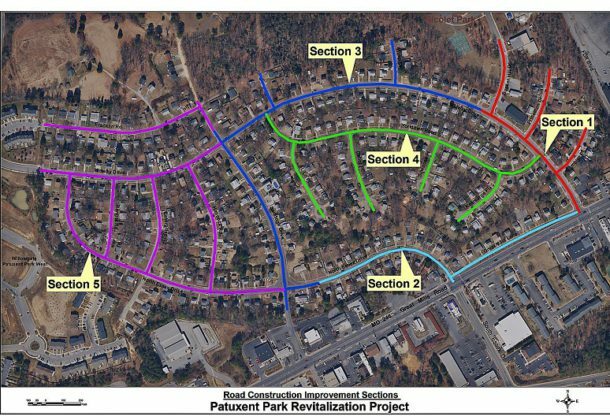 A construction contract for Section 3 of the Patuxent Park Revitalization Project has been awarded to Great Mills Trading Post Inc.
A notice allowing work to begin has been issued for Monday, July 2, 2018. Construction is scheduled to follow soon thereafter. The project will take approximately nine months to complete. Improvements will be performed on Saratoga Drive, part of Midway Drive (between Saratoga Drive and Bunker Hill Drive), part of North Essex Drive (near Saratoga Drive intersection), Wasp Drive, and Card Road. Work will involve the reconstruction of roads, sidewalks, driveway aprons, and storm drainage system (including storm water management devices). While construction is underway, residents may experience temporary inconveniences such as parking restrictions, roadway lane closures, construction noise, and construction vehicles in the area. Temporary “No Parking” signs will be placed at least two days in advance of work at each street location. At that time, residents are asked to relocate their vehicles parked along the roadway. Fences within the county right-of-way, located within the limits of grading, may need to be removed and re-installed to allow for a smooth transition into existing grade. Every effort will be made to minimize disturbance during construction. Monthly construction updates and additional project information will be available on the St. Mary’s County government website. For more information, contact the Department of Public Works and Transportation at 301-475-4200, ext. *3525. Great Mills Trading Post is a sales, construction and general contracting headquartered in Great Mills. The company is deeply rooted in the community. Founded in 1970, the Trading Post originally bought and sold used furniture and later added used equipment and cars to the mix. In 1987, the Trading Post merged with the Great Mills Construction Company, which has been a major provider of construction and equipment support services to state, local, and federal governments for over 30 years. For more information about Great Mills Trading Post, visit its Leaders member page.